Explore an expansive RPG world in search of a cure for an accursed ailment which has befallen the land. Embark on a character-driven RPG adventure from the creators of Fallout: New Vegas and South Park: The Stick of Truth. 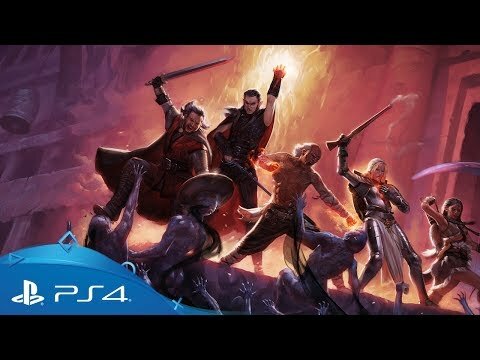 Pillars of Eternity draws you into the imperiled world of Eora and charges you and your cohorts to set out in search of a cure for the terrible 'Hollowborn' epidemic. Explore a vast and complex world filled with deep political lore and history, meeting and bartering with dozens of different characters as you investigate the stricken region. New party members will join your ranks as you progress, bringing additional skills, connections and story options to the ongoing quest. Carefully redesigned from the original release, the 'Complete Edition' features a completely reworked user interface and control scheme designed to work perfectly in a console environment. It also includes all the original DLC add-ons, including The White March story expansions. On the hunt for adventure? Embark on a science-fantasy journey of many lifetimes in Torment: Tides of Numenera on PS4. Discover a fantasy world in the grip of magical heretics in Divinity: Original Sin on PS4. Join the crusade against Death itself and face ultimate evil in the definitive Diablo experience.